Barbie is Princess Rapunzel in this fun Barbie doll game. Change Barbie's dress and put flowers on the Rapunzel Barbie Doll. Click the paint spots to change her dress. Click on the brushes to change her hair. Click and stick on pretty things like bows, crowns, jewels and more! When you're done click next to meet the prince. Barbie has to be well dressed to meet her Prince. Click the paint spots to change her dress. Click on the brushes to change her hair. Drag and drop clothing with your mouse to dress up Barbie As Rapunzel. Click the paint spots to change her dress. Click on the brushes to change her hair. Click & stick on pretty things like bows, crowns, jewels & more! When you're done, click Next to meet the prince! 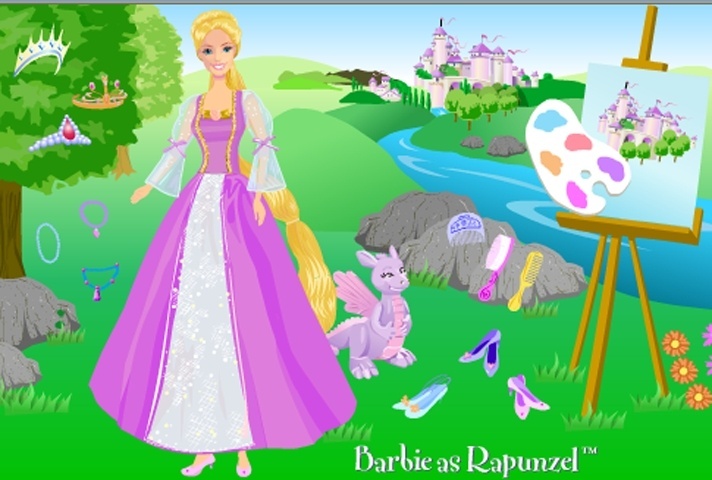 If you want to play Barbie As Rapunzel Dress Up games online you have come to the right place! GamesLoon adds new Barbie As Rapunzel Dress Up games every week. This is your game portal where you can find the biggest collection of free Barbie As Rapunzel Dress Up games online. Do not forget to rate our Barbie As Rapunzel Dress Up free online games while playing!